Bear Creek (30 min) – If you’re looking for a quick trip from Metro Denver, Bear Creek is the perfect place to wet your line before or after work. Don’t be afraid to present a dry fly or hopper to the resident Brown and occasional Rainbow Trout—(em dash)they are always eager to take a well-presented fly. As long as the water has public access, you will find fish feeding from Evergreen Lake downstream to Lair o’ the Bear Park. South Platte River – Waterton Canyon (45 min) – With 6.5 miles of public access water, Waterton Canyon is also a great choice close to Denver. With access by foot and mountain bike, you may find yourself fishing for Brown and Rainbow Trout next to a herd of Bighorn Sheep. Fishing is typically better higher up in the canyon closer to Strontia Springs Dam. 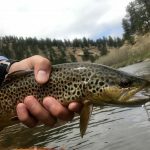 South Platte River – Deckers (1 hr 15 min) – The Deckers section of the South Platte, from the mouth of Cheesman Canyon to the confluence of the North Fork, is a world-renowned fishery. 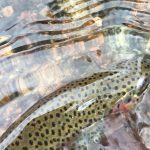 Catching 20+ inch Brown or Rainbow Trout is not uncommon, but you will have to battle the crowds due to its close proximity to the Front Range. A good nympher will catch a handful more fish than that on the surface, but these fish are educated and will only take a well-presented fly whether it’s above or below the surface. The Big Thompson – Estes Park (1 hr 25 min) – At the foot of Rocky Mountain National Park, The Big Thompson is synonymous with fly fishing in Colorado. With the best public access directly below Estes Lake, you can expect to catch 12”-16” Brown and Rainbow Trout. Nothing beats the incredible views of the national park in the distance or the occasional elk wading through the stream. This section acts as a true tailwater, so make sure to plan your fly arsenal accordingly. Tight lines and enjoy your time on the water!